Jeff Gordon and Hendrick, names synonymous with racing, performance and Chevrolet. 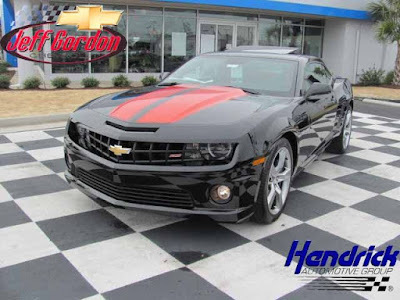 Now Jeff Gordon Chevrolet and Hendrickcars.com have joined these two great names to offer over 500 new Corvettes, new Camaros, GM Certified Pre-owned Corvettes and GM Certified Pre-owned Camaros, plus gently used Corvette and used Camaro models from the sixties, seventies, eighties and nineties. If you've always wanted a Brand New Corvette or Camaro, here is the opportunity you've been waiting for. Jeff Gordon Chevrolet currently has an allocation Corvevette's & Camaro's that can be modified to your exact specifications. You pick the color you want, you choose the options you can't live without. Your vehicle will come straight from the factory to the showroom of our 15 acre Award Winning Chevrolet Dealership in Wilmington North Carolina. Don't live near Jeff Gordon Chevrolet? No problem, our GM Certified Internet Sales Managers can arrange hassle free delivery right to your front door. And because we're a Hendrick Automotive Group Dealership, you can be assured we'll be here for you long after the sale. Jeff Gordon Chevrolet and Hendrick Motorsports are also producing a limited number of Performance Camaros that are available exclusively at Jeff Gordon Chevrolet. Destined to be collectors items, these Camaro's are In Stock for immediate delivery and can also be ordered with a 6 speed manual or automatic transmission. The Hendrick Performance (HP) Camaro’s feature supercharged engines with up to 588 horsepower, unique styling, and suspension improvements engineered at Hendrick Motorsports. Jeff Gordon Chevrolet offers the Hendrick Motorsports Heritage Center Delivery Option. Order a 2011 Hendrick Performance Camaro and take delivery in Charlotte North Carolina at the Hendrick Motorsports Facility!!! The Hendrick Motorsports Facility is where the transformation from stock Camaro to Performance Camaro begins. With a current staff of more than 82 specialists, the Hendrick Engine Program also does extensive developmental work for General Motors while setting the pace in cutting-edge technologies.